After a summer with a lot of rough spots, I was looking forward to a calmer fall. No such luck of course, although the tone of our days has changed a bit. This summer was successful in many respects but we also lost a few good cats along the way. Here's who we lost (this kind of goes on for a while). Blue. 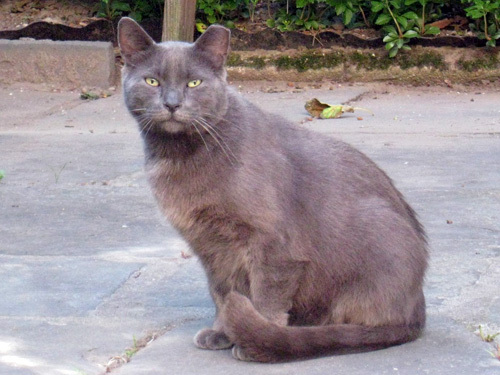 One of the first batch of cats we ever TNR'd, Blue was a fixture in the backyard. He went from slender to obese over the years, and seemed happy to accept the newer cats as they moved in. He never had a close buddy like he did in the days of Edmund and George, but he was close with White Fang and got along well with everybody. Sometime this summer we noticed he wasn't showing up for food, which should have been a red flag right there. We kept a look out for him for the next few weeks but we never saw him again. I assume he was hit by a car, even though I rarely saw him leave the yard. Even with all the enticements we try to provide them, feral cats are still free-roaming and unfortunately we can't easily stop them from stepping into the street. This seems likely to be what took Blue, cars have been the reason for almost all the feral deaths we've had. Dimples Appleby. We often get "Eartip Alerts" when a fixed feral gets brought into the city pound (TNR cats get their ears tipped off so they can be easily identified in the field). If the cat's caretakers can't be found, they try to find somebody to take in the errant cat, usually by assimilating them into an existing colony. This involves keeping the cat in a crate in the colony for a few weeks, then hoping it sticks around upon release. We've done this a number of times, so when a cat named Blue turned up on the Eartip Alert list who was from nearby, we offered to take him in. Blue was in bad shape, very old, thin and dirty with matted fur. We couldn't put him outside right away in this state, so we set him up in a cage inside. His appetite was good so he improved quickly. 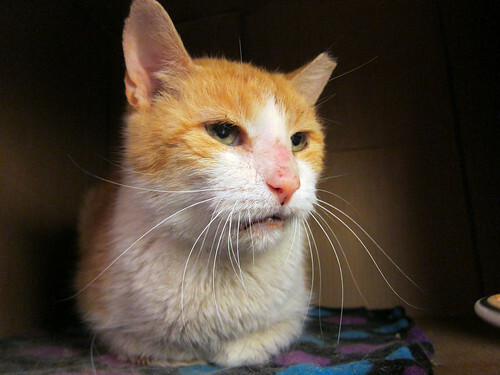 After a dental extraction he got even better. He turned out not to be feral but totally tame so we let him roam free; he soon became good pals with our cat Jefe. We gave him the silly name Dimples to differentiate him from our other Blue. He continued to improve through the summer, so much so we started looking for an adoptive home for him. We eventually found a willing home that would have been perfect: a good sized apartment with an older female cat who liked to groom other cats. But just before he was to move out, he took a turn for the worse. X-rays indicated he had an enlarged heart. We put him on heart medication but by this time it was already too late. He only lived a few days more. Doyle. We have several ferals we feed in the front of our house, most of whom live across the street in a vacant lot. We've always been aware that it can be dangerous for the cats to cross over to us, but we weren't sure how else to help them without feeding on somebody else's property. I built a cat house out front and a couple of the cats (Horace & Mongo) spent the winter inside it. But there were always cats who would come over to eat, then rush back across the street. A month ago Horace got hit by a car and we feared the worst. It turned out he wasn't injured, just heavily bumped, but he was too scared to cross the street any more. Soon after this, we found a cat named Doyle dead. He had clearly been hit by a car and crawled under our stoop to die. Doyle was part of the same colony that lives in our yard, but he had moved back to his original yard after we released him. He had been fine over there all this time, in fact we didn't even know he was coming over to eat at all. But clearly, having food out like this was becoming a dangerous problem. So we started setting up our drop trap out front. 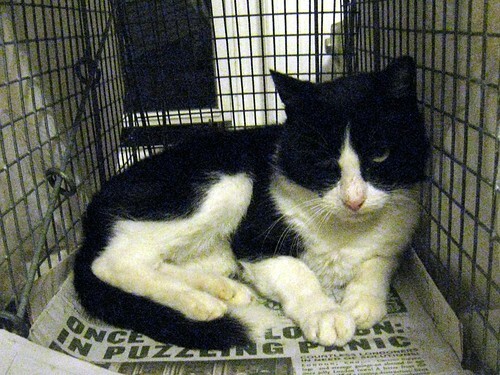 We caught two of the cats, Snopes and BT Dubs, and set them up in the assimilation cage in back. They did well, but this kind of assimilation is tough to pull off. These cats knew they weren't miles away from their old haunts, they were just behind the house. They have since been released and we haven't seen much of them, although I'm pretty sure I saw them both out front again already. The new plan is to quietly drop food off at the vacant lot on the way to work in the morning. Hopefully nobody will mind. Next up: the Current Cat Roster. This entry was written by Jimmy Legs, posted on October 30, 2013 at 11:04 am, filed under Bad Stuff, Cats and tagged bushwick street cats, death, Feral, goodbye, TNR. Bookmark the permalink. Follow any comments here with the RSS feed for this post. Both comments and trackbacks are currently closed.